Author: A. H. Phelps, Jr. Plot synopsis: The inhospitable living conditions on Venus lead to a steady drain of colonists returning to Earth, presenting the UN Offworld Commission - which is responsible for recruitment to the Venus colony - with the problem of how to reverse this trend. Based on a short story, 'The Merchants of Venus', first published in Galaxy Science Fiction magazine, in March 1954. Plot synopsis: A mysterious figure, the eponymous Mr. Costello, sows fear and discord wherever he goes. Based on a short story first published in Galaxy Science Fiction magazine, in December 1953; and later in Theodore Sturgeon's short-story collection A Touch of Strange, in 1958.
Review: The story upon which this episode is based was written as a satire on McCarthyism, which was at its peak when the piece was published. However, anyone listening to the episode today would be forgiven for not realizing this, as the adaptation doesn't do a very good job of translating the story into a radio drama. The problem is that it is often quite opaque what the point of the story is, not helped by the fact that the character at the plot's centre, Mr. Costello, appears only sporadically. Consequently, we get very minimal insights into exactly how he manipulates people, and even causes the whole colony planet to which he travels to become riven with conflict and paranoia. We do discover that he uses selective excerpts from taped recordings he makes of conversations, but as well as seeming very old-fashioned, this hardly seems particularly sophisticated. Furthermore, the episode's theme of individualism versus conformity is handled in a very clunky manner. Finally, the way in which Mr. Costello is foiled, and his malign influence over the colony world is undone, is very rushed, dealt with in just a line or two of exposition towards the end. All in all, a weak episode, despite the classic status of the short story from which it is adapted. Plot synopsis: A woman who feels suffocated by having to live in a sealed shelter following a devastating atomic war decides to open a window, despite it being forbidden, which attracts the attention of a 'mutant' who tells her that the world outside is not the inhospitable wasteland she has been led to believe it is. Based on a short story first published in Galaxy Science Fiction magazine, in April 1952; and later in Fritz Leiber's short-story collection The Secret Songs, in 1968.
Review: Perhaps unsurprisingly, given the Cold War context of superpower tensions in which the series was produced, a number of X Minus One episodes were set in the aftermath of nuclear war - including The Defenders, Hello, Tomorrow and There Will Come Soft Rains. This story is another example of this subgenre. It is also one of the least effective - in fact, I found it quite irritating, thanks to the annoying main character. 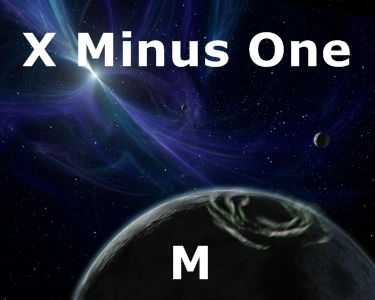 It was relatively unusual for X Minus One episodes to be told from a woman's perspective, so initially I had high hopes that this might offer an interesting, different take on the idea of living in a post-apocalyptic world. Furthermore, to begin with, the protagonist has the listener's sympathy because her husband is a thoroughly unpleasant, arrogant bully. Unfortunately, though, as the story develops, the main character rapidly loses any audience goodwill, as she reveals herself to be pretty much an idiot, and a very gullible one at that. This is shown by the way that - SPOILER ALERT! - she is completely taken in by the patently false claims of the 'mutant' outsider she encounters, when he tells her that the world beyond her shelter is in fact an idyllic one, filled with happy, care-free people. Okay, maybe the stultifying life she leads inside the shelter explains why at first she is willing to believe his lies, but once her husband has proven to her that the outside world is still a nightmarish landscape poisoned by radiation, it makes much less sense. Worst of all, even if she is willing to commit almost certain suicide by following the stranger outside - though she must be not only stupid, but incredibly naive if she has no suspicions at all about his intentions towards her - and die what will likely be a horrible, painful death, the fact that she is pregnant makes her decision extremely questionable and problematic. In this respect, the episode reminded me of another that adopts the woman's viewpoint, Jaywalker, as the protagonist of the latter similarly appears lacking in both intelligence and common sense, and also puts her unborn child's life in great jeopardy. It's a pity X Minus One didn't produce a few more stories in which the female lead is not irrational, foolish and driven purely by emotion (though there were some - for example, Hostess, a very good episode in which the heroine is a more than competent scientist).